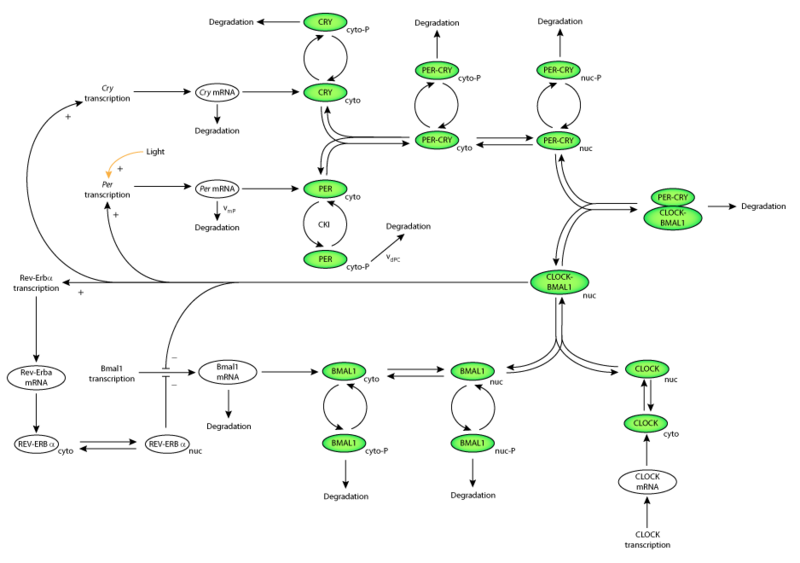 This CellML model runs in OpenCell to recreate the published results (figure 2A from the published paper, where KAC = 0.6nM). The model needs to be run for 160 hours with a step size of 0.1 hours, and MP, MB and MC are plotted. Ignore the first couple of oscillations as the model needs to stabilise. Please note that the model presented here is the extended version of the model which includes equations to define the role of REV-ERB-alpha in inhibiting the transcription of Bmal1. There are 19 equations and the parameters are listed as part of the Supplementary data set under Figure 8. ABSTRACT: We present a computational model for the mammalian circadian clock based on the intertwined positive and negative regulatory loops involving the Per, Cry, Bmal1, Clock, and Rev-Erb alpha genes. In agreement with experimental observations, the model can give rise to sustained circadian oscillations in continuous darkness, characterized by an antiphase relationship between Per/Cry/Rev-Erbalpha and Bmal1 mRNAs. Sustained oscillations correspond to the rhythms autonomously generated by suprachiasmatic nuclei. For other parameter values, damped oscillations can also be obtained in the model. These oscillations, which transform into sustained oscillations when coupled to a periodic signal, correspond to rhythms produced by peripheral tissues. When incorporating the light-induced expression of the Per gene, the model accounts for entrainment of the oscillations by light-dark cycles. Simulations show that the phase of the oscillations can then vary by several hours with relatively minor changes in parameter values. Such a lability of the phase could account for physiological disorders related to circadian rhythms in humans, such as advanced or delayed sleep phase syndrome, whereas the lack of entrainment by light-dark cycles can be related to the non-24h sleep-wake syndrome. The model uncovers the possible existence of multiple sources of oscillatory behavior. Thus, in conditions where the indirect negative autoregulation of Per and Cry expression is inoperative, the model indicates the possibility that sustained oscillations might still arise from the negative autoregulation of Bmal1 expression. Model for circadian oscillations in mammals involving interlocked negative and positive regulations of Per, Cry, Bmal1, and Rev-Erb genes by their protein products. Derived from workspace Leloup, Goldbeter, 2003 at changeset 6de424a124d8.